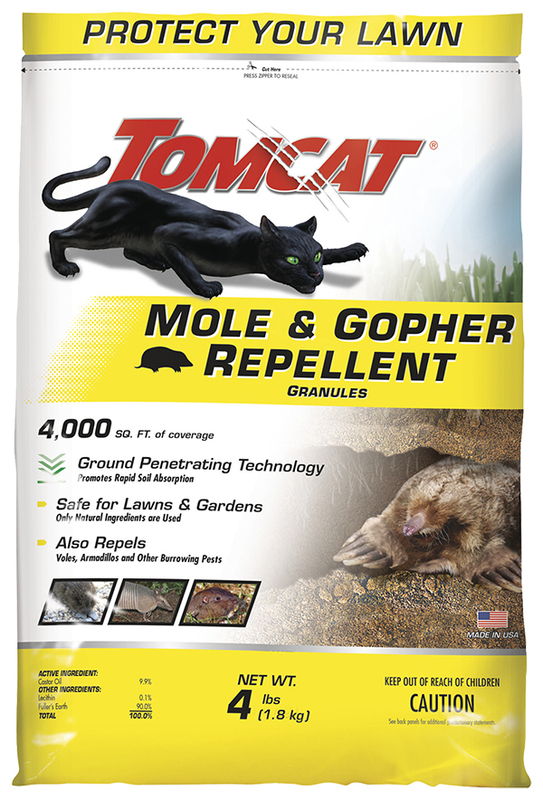 Tomcat® Mole and Gopher Repellent Granules utilizes a proprietary formulation that improves the ability of the active ingredient, castor oil, to penetrate into the soil. The repellent not only deters moles and gophers, but also voles, armadillos and other burrowing pests. Treats 4,000 sq. ft. for maximum coverage and is safe for your lawn and garden. Start where pest damage is noted on the lawn and move outward out of yard area. Day 1: Spread granules over the undamaged lawn first, preventing mole damage in these areas. Also start treating the damaged lawn nearest to the undamaged lawn. This will start the process of moving moles away from your lawn. Water granules for approximately 20 minutes on a light shower setting. Water & GPT allows the repellent to absorb into the soil more thoroughly. Day 2: Continue the movement of moles by spreading the granules away from undamaged lawn and towards the boundaries of your lawn. Spread the granules over the second area; water the same area as Day 1 plus the second area to get moles moving. Each watering allows the granules with GPT to penetrate more deeply. Day 3: Spread the granules over the third area. Water the same area as Days 1 and 2 plus the third area. Day 4: Spread the granules over the fourth area. Water the same area as Days 1, 2, and 3 plus the fourth area to push the moles out of your yard. If for any reason you, the consumer, are not satisfied with this product, mail us your original proof of purchase to obtain a full refund of your purchase price. See "How to Use" and "For Best Results" section for watering instructions. Effective against most common mole species. Mimics a mole's natural food source - the worm. It kills in a single feeding, often within 12-24 hours of ingesting a single worm. Utilizes a proprietary formulation that improves the ability of the active ingredient, castor oil, to penetrate into the soil.